Prior to drilling holes through a roof deck to install new storm drains, plumbers on site decided to contact GPRS to locate post tension cables first. 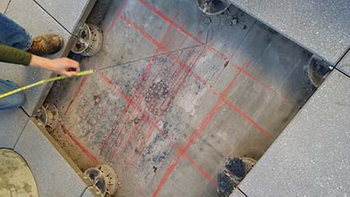 Central Texas Regional Manager, Corey Brecht, was able to use non-destructive GPR testing to identify critical reinforcing steel and other obstructions within the concrete so that the plumbers could core through the deck safely. To find out how GPRS can safely help you find rebar, post-tension cables, and conduit in your slab, please call Corey Brecht at (512) 417-6105 or email at corey.brecht@gprsinc.com.